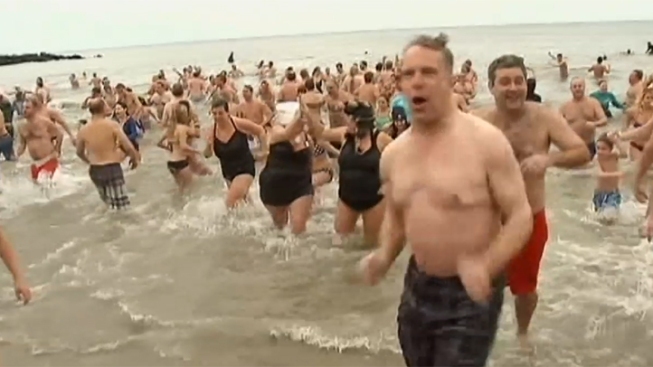 Some hearty souls began their 2013 by taking a swim in the cold Pacific. The annual La Jolla Cove Swim Club's Polar Bear plunge kicked off this morning at La Jolla Shores. Dozens of people braved the chilly water. Participants said it only took a few minutes to warm up in the water, but their motto was "know your limits, health and safety come first." "It's a little nippy today," said participant Jim Fitzpatrick. "You could tell, start talking and you're slurring your words a little bit. When you stop you get colder." People around the country got their New Year off to an icy start. About 500 people ran into the Atlantic for the 10th annual Sons of Ireland plunge in Asbury Park, New Jersey. They donated money for Hurricane Sandy relief.